Exchange-traded funds that track marijuana stocks, including the Horizons Marijuana Life Sciences Index ETF in Toronto and the U.S.-listed ETFMG Alternative Harvest ETF, jumped to fresh highs on the news, gaining as much as 9.1 per cent and 7.9 per cent, respectively. Tilray Inc. posted the biggest increase, climbing as much as 34 per cent -- the most since Sept. 19, when the stock almost doubled before giving back most of the gains in a wild ride for investors. Other cannabis-related stocks in both the U.S. and Canada also advanced. Sessions was a major opponent of marijuana legalization, moving last January to rescind an Obama-era policy that allowed states to make their own decisions on cannabis without interference from the federal government. That announcement sent pot shares plunging three days after California became the largest jurisdiction to legalize recreational use. Cannabis stocks had already risen Wednesday after Michigan voted to legalize recreational marijuana and Missouri approved medical pot. The Democrats’ House of Representatives win was also thought to be a positive catalyst for stocks, making legal reform more likely. 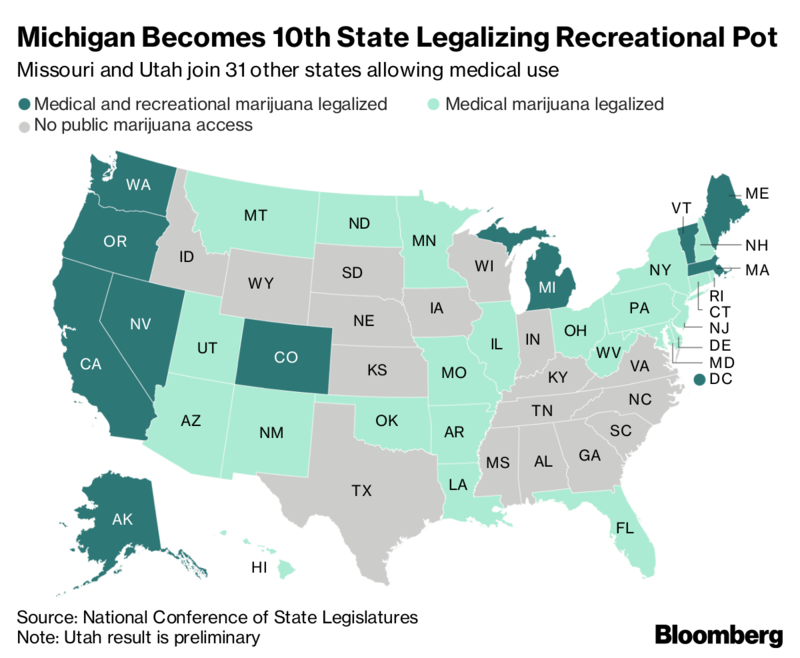 Michigan became the 10th U.S. state -- and first in the Midwest -- to legalize recreational pot. Sales there, estimated to start in 2020, could grow to as much as US$1.7 billion in the coming years, according to the trade publication Marijuana Business Daily. The total legal U.S. market is expected to hit about US$11 billion in sales in 2018. With Michigan voting to legalize adult use, neighbors like Ohio and Illinois could soon follow suit to help build a market in that region. Long demonized as a dangerous drug, and still considered an illicit substance with no medical use by the federal government, marijuana is increasingly going mainstream as investors pour billions into the industry. Cannabis is now legal across Canada, and U.S. firms are rushing north of the border for public listings and to access capital markets. In the U.S., meanwhile, the steady creep of legalization has companies buying up licenses and expanding operations. In addition to the recreational market, more states are embracing medical marijuana. Missouri became the latest state to allow medical use, while a proposition in Utah also appeared poised to pass after Tuesday’s vote. Adding two more states with medicinal marijuana would mean almost 70 per cent of Americans could have access to the drug for that purpose. Some in the industry see federal legalization of medical marijuana as the best path to ending prohibition in the U.S., which has held big banks and institutional investors on the sidelines. Still, not all states were ready to follow Canada’s lead: North Dakota’s ballot measure to decriminalize marijuana failed. More than 60 per cent of Americans support making pot legal, but with cannabis still illegal on a federal level, the politics remain fraught. In the aftermath of the midterm elections, attention in the cannabis industry is turning to Congress and the 2020 presidential ballot. Democrats in the House may hold hearings on marijuana and pursue legislation that would ease banking restrictions or even end federal prohibition.